When the Ooni was ushered into the conference hall venue of the event, I saw the best of Yoruba culture on display! Talking drums, high chiefs, various categories of priests, including Esu Laalu paid homage to the Ooni and sang his praise in high-pitched tones that could make one cry! It was royalty, elegance and splendour all rolled into one! Ooni was so regal in his all white outfit, with a shining crown and gold coated shoe! I had read and heard a lot about His Imperial Majesty, the Ooni of Ife, Oba Enitan Babatunde Ogunwusi, Ojaja II, but it was a memorable experience when I and six others, met him in person in the private sitting room located within his magnificent, awe-inspiring, ancient and timeless palace in Ile-Ife on Friday, March 29, 2019. We arrived Ile-Ife almost two hours after we left Ado Ekiti. I have driven past the palace of Ooni a number of times but hadn’t entered the historical edifice until that Friday. I had never encountered such a gigantic epitome of culture and tradition prior to that experience. I have no words to describe the ambience, the environment, the edifice and the ilaris (courtiers) of the Ooni who received us right from the first gate! There were hundreds of Ooni’s courtiers, both male and female, who wore white dresses. The most noticeable of these were the drummers who beat their talking drums in a spectacular way, quite different from all the talking drums I have ever listened to! The talking drums welcomed us, with interpreters telling us what the drums were saying. We were first ushered into the big conference hall of the Ooni, which can conveniently seat about 500 guests. The raised platform where the Ooni seats to receive visitors in the expansive hall was so picturesque and only befitting of an imperial majesty of his status. The event earlier scheduled to start by 11.30 a.m. was shifted to 1.30 p.m. and we arrived around 12 noon. A few minutes after we were seated in the hall, a protocol officer came and took seven of us to meet the Ooni in his private sitting room. We were ushered into the private waiting room of the Ooni, where we met other guests like the president, Institute of Chartered Accountants of Nigeria (ICAN), Alhaji Adeleke Jayeola and a traditional ruler waiting to see him. The courtiers in white dress kept singing the praise and pynergerics of the Ooni. About 20 minutes into our waiting, the Ooni emerged from one of the rooms in the big building to the waiting room, with all the Ilaris paying obeisance and the tempo of praise singing and drumming increasing significantly. We were finally ushered into the Ooni’s private sitting room. I will never forget the experience! On seeing the Ooni on his majestic throne in the sitting room, my head swelled and I instantly had goose pimples! He wore his traditional white regalia with a shining crown and beads all over it, with one of the Ilaris holding his staff of office. Everything about him smelt of royalty, culture, power, influence and mythology! The Ilaris had informed us that shoes were not allowed inside the Ooni’s private sitting room, so we had removed our shoes before entering. We prostrated and greeted the Ooni. The Ooni surprised us when he called the Ekiti State governor, Dr. Kayode Fayemi and put him on speaker, informing and thanking him that a substantial part of the Ekiti State government was in his palace to celebrate him! Governor Fayemi simply told the Ooni that we are all his subjects and are at his beck and call. The Ooni prayed for all of us and admonished us to cooperate with the governor to serve our people better. He especially thanked Elder Samuel Abejide for supporting Governor Fayemi with his wealth of wisdom. We left the Ooni’s private sitting room after about 20 minutes and proceeded to the hall for the event and to await his arrival. There was a shout of Kabiyesi three times by all who paid homages. Ooni was addressed in many other prefixes like Oonirinsa, Iku baba yeye, Arole Oodua, Atewonran, Oko Oso, Oko Aje, Odundun a sode dero (Ooni the deity, the custodian of death, the husband of witches and wizards, the harbinger of good tidings), etc. After the paying of homage by the aforementioned groups, which took about 30 minutes, the programme proper started and it was then we learnt the keynote address to be given by the chief of staff would be the last programme of the event, as the Ooni insisted that we, his Ekiti guests, must see the end of the programme and wait for refreshment at the Oonis private dining room! Who were we to disobey the Arole Oodua? The ICAN president read his speech. He confirmed the exemplary leadership of the Ooni as a cultural ambassador and a lover of development of the youth. The philanthropic activities of the Ooni came to the fore when graduating medical students and the Students Representative Council of Afe Babalola University, Ado Ekiti (ABUAD) came to appreciate the Ooni, whom they said had assisted many indigent students financially, which enabled them to graduate. Apart from this, Ooni gave the best graduating student N250,000, while over 32,000 students across Nigeria are on his scholarship. They presented him a gift. Ooni thanked the ICAN president for the visit and affirmed that he is part of them and would have been more active but for his present divine assignment as the Ooni of Ife and father of the Yorubas. He appreciated the ABUAD students for their gift. The Ooni gave the ICAN president Alhaji Adeleke Jayeola a symbolic gift of a portrait containing a gangan drum (talking drum) and sekere (dried gourd with beads). Next to pay homage were the Nigerian Black Arts from the United States of America, led by one Yetunde Fasina. They were brought by a descendant of Oranmiyan called Erelu. They are responsible for encouraging foreigners to travel to Nigeria. They thanked the Ooni for being a cultural ambassador and for empowering the youth. A lady singer from Oyo brought by Arewa House of culture sang the praises of the Ooni in a special way. It was very moving indeed with a pin drop silence in the expansive hall during the rendition. There was also another group of entertainers having two kids as dancers. The main objective of The Yoruba Youth Council, who were the organisers of the event, is to unite the Yoruba youth, including those in Kogi, Kawara and Delta States and to restore the lost Yoruba culture. Members of the Yoruba Youth Council paid homage to the Ooni. They also presented an award to him in recognition of his contribution to the growth of the Yoruba youth and culture. The chief of staff presented a powerful paper in which he espoused the virtues of the Ooni, who is a renowned cultural ambassador. Omoleye appreciated the organisers for a job well done. He maintained that the erosion of our cultural and social heritage is reason for the poor leadership being experienced in several aspects of the Nigerian society. He charged the youth to brace up for the challenges ahead in reclaiming our country and arresting decay of our culture. Omoleye advocated that traditional rulers should be empowered to handle cases relating to cultural differences, ranging from child abuse, matrimonial, communal differences and disputes. This will decongest the conventional courts and reduce prison inmates. This will also stabilise the society rather than the punitive English legal system that we are currently practising. Omoleye is consoled by the fact that with a personality like Oonirisa Oba Ogunwusi on the throne, all hope is not lost as our Imperial Majesty is well positioned to champion the course of the reformation and restoration of Yoruba values and culture. In his remarks, the Ooni agreed with the Ekiti State chief of staff that the South-West region stands the chance of regaining its leading role in the country if it embraces unity and value reorientation. Apart from the Ooni who received the award of Lord of Culture, other awardees were: Dr. Tokunbo Awolowo Dosumu, Hon. Biodun Omoleye, Chief. Fola Akinosun, Chief Olu Ogundola, Adebayo Adelabu (Penkelemeesi), Hon. Tajudeen (Small Alhaji), the youngest member-elect of the House of Representatives from Ondo State. “Alayeluwa Oba Adelekan Sijuwade Olubuse I, (The grandfather of late Oba Okunade Sijuade, Olubuse II) was the first Ooni ever, to travel out of his domain. At the invitation of the Colonial Governor, Ooni Adelekan Olubuse I, visited Lagos in 1903 to give his ruling whether the Oba Elepe of Epe was entitled to wear a beaded crown. That unprecedented journey to Lagos according to the government gazette, caused a stir in Yoruba land, because as a mark of respect to the Ooni, all Obas and princes momentarily vacated their thrones throughout the period of the Ooni’s sojourn in Lagos. When the Ooni finally arrived in Lagos, transported in his hammock, under a flutter of colorful, giant, royal umbrella, with his retinue of courtiers in toe, he was a sight to behold. 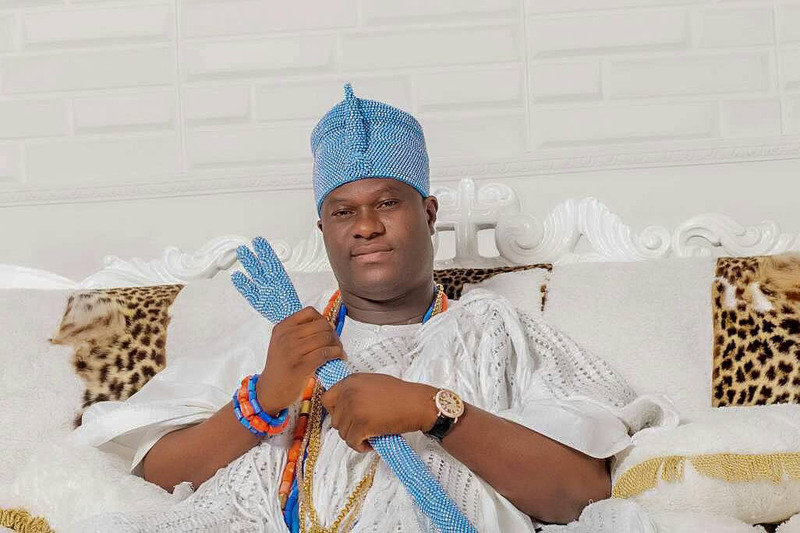 May the reign of Alayeluwa, Oba Enitan Ogunwusi, Ojaja II, the Ooni of Ife, be long, while he continues to revive yoruba culture and be a source of inspiration to the youth. Hakeem Jamiu is the member-elect, Irepodun-Ifelodun Constituency 2, Ekiti State House of Assembly. He could be reached via: hakeematus@gmail.com.